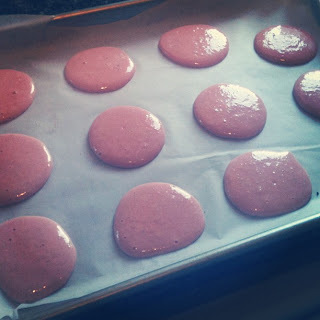 I started off by lining two cookie sheets with greaseproof paper and drawing smallish circles onto the paper,so all the macarons would be a similar size. I then turned the greaseproof paper over so I didn't get pencil on my biscuits! The recipe then said "Using a metal spoon, add half the almond mixture to the meringue and fold gently together. Add remaining almond mixture and stir to combine." Can anyone explain why a metal spoon and why do it half fold/ half stir? Is this necessary? I then added a smidge of vanilla and some pink colouring and dolloped it into a piping bag fitted with a plain nozzle. I then piped them into little macaron shapes and left them to sit for 30 minutes until a skin formed. I baked them at 140 (fan oven) for around 13-15 minutes. I made a simple buttercream with a dash of almond extract for the middle, decided to leave it plain in colour bit added a little edible glitter for funsies. I got around 7 decent looking macarons out of the 18 I made, so it wasn't a complete success but I was pretty pleased. 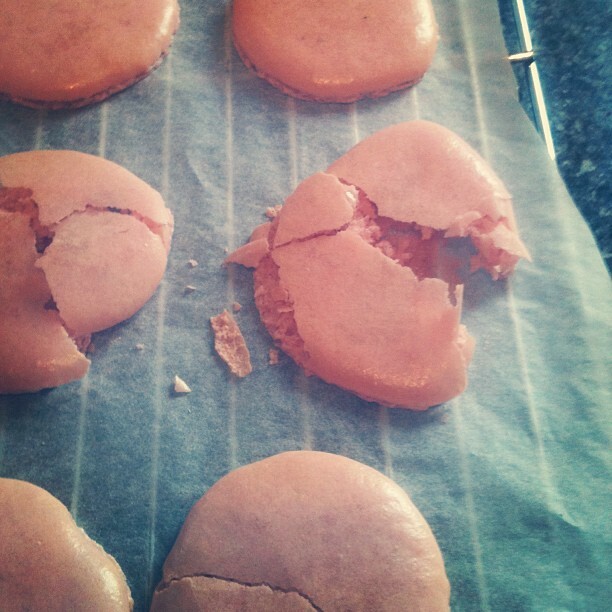 I think the mixture was a little bit too thin so the macarons spread a little while resting, making for a slightly flat bake. I definitely need a bit more practise and I still want to try the sugar syrup method to compare. So to summarize; lots more macarons to come! Have you been brave enough to try them? Were you successful? I tried Dan Lepard's recipe last week and they all stuck to the paper. Not sure if this because I made a schoolgirl error and used greaseproof instead of baking parchment or if I didn't leave them quite long enough in the oven - I have a new oven and I've still not quite got the measure of it. The recipe definitely made for a thicker macaron - it didn't spread at all whilst resting, but I ended up with little tails on them and no feet. They were definitely more rustic looking - like these ones http://www.guardian.co.uk/lifeandstyle/2011/jan/15/marmalade-cream-macarons-recipe-lepard than the Laudree style. Will def have another go myself one day. There are zillions of slight variations out there, it's just knowing which one to try next. Yes, your problem was using greaseproof paper, which is far from non-stick. Always use non-stick baking paper if the recipe specifies it. 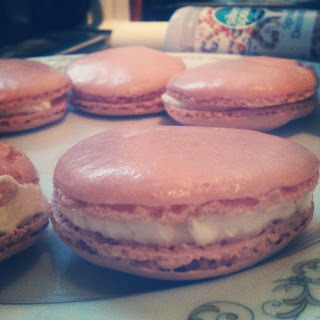 I forgot all about Macs after my first failed attempt with no feet macs. Yours look lovely, congrats! Congratulations brave woman! They look brilliant for a first attempt. I still haven't tried them, too terrified. I think part of it is because I'm inexperienced with meringue making in general. These look great! I've still not been brave enough to try them yet especially after hearing so many horror stories. It was one of my 'resolutions' to make them this year but it will have to wait till next year.